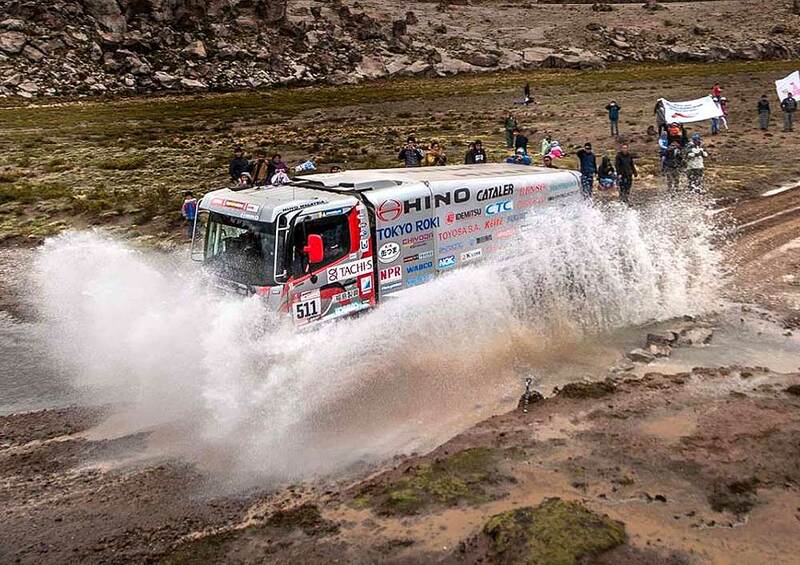 The Hino 500 truck of Team Sugawara also reached Bolivia. Organizers took into consideration the 25-minute delay that Car 2 sustained on Jan. 10 from a car blocking their way, and the SS finish position of the Hino 500 Series truck crewed by Teruhito Sugawara and Mitsugu Takahashi was corrected from 12th to 10th. There was no change in accumulated rankings from this correction. The Hino Team raced SS06 with calm aplomb. The truck finished at 16th place overall as the crew remained diligent against flat tires on hard surfaces and stayed away from navigating errors. While their accumulated ranking fell to 6th place from this result, they continue to maintain the top position in the Under 10-liter Class. "Thursday's SS was the first one at high elevations, and we had no problems at all thanks to the oxygen generators we used during the race," said Teruhito Sugawara. "Our current position is in line with what we had planned for the end of the first half. We will be up against mountain roads from here on so we will make sure to take even better care of the truck's body." Navigator Mitsugu Takahashi added: "Navigation-wise, things were simple compared to the dunes we have been racing on until yesterday. I concentrated on reading out the road book accurately in sync with Mr. Teruhito’s speed. I think I'm much more used to his speed now."